With all the developments we’ve seen in online advertising over the years, you’d have thought that someone would have figured out how to put a halt to what must be one of the biggest issues of all: people are getting fed up with digital ads. A new report from YouGov, commissioned by mobile marketing company Upstream and provided to TechCrunch before wider release, indicate that people basically feel like there are too many ads, and that they are too pervasive. The situation seems to be a vicious circle. Users are engaging with ads less and less: response rates that were at an average of 7 percent in 1997 have today plummeted down to 0.1 percent for an average online ad. The solution? Serve more ads to get the respond numbers up. The result? More annoyance with online ads, and even less engagement: total digital ad impressions for all media in 2011 were at 5 trilliion, compared to 200 billion in 1997, according to comScore. Surveys like this speak to some of the issues that the online ad industry is going to have to sort out as it keeps growing, and means opportunity for new players and new formats like those being developed by Facebook. But as information gathering becomes more sophisticated, issues around invasiveness and privacy will also grow. 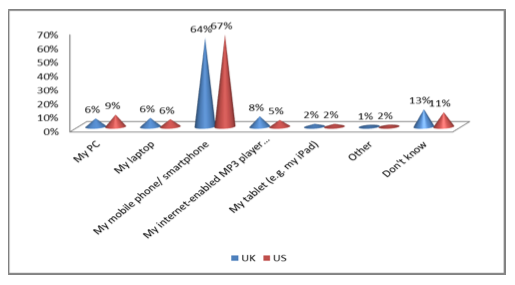 Surveying 4,150 consumers across the U.S. and UK, YouGov found that 66 percent said that they got bombarded with too many digital ads — online and on their mobile devices. An equal number, 66 percent, said their perception of brands changed when felt their promotions became too invasive. But it can be more damaging than that: some 27 per cent of UK and 20 per cent of U.S. consumers said that too frequent advertising or promotional messages would result in them not using the product from the brand in question completely, while only 1 per cent of UK and U.S. consumers said that excessive messages led them to use products more. And around 10 percent said that they would go activist as a result, taking to social media sites to complain. That has a lot of resonance when you think about some of the more prominent direct marketing campaigns of late — those of daily deal sites that email offers to their users — and the fatigue that has meant less engagement in those promotions. In the UK, YouGov found that some of that dislike related to economic grouping, with upper middle class users less happy with ads than those with less money. (Corresponding numbers were not available for the U.S.) Young adults in both markets (18-34) were slightly more tolerant of ads than older users. Women were more tolerant than men when it came to digital ads. Devices. A clear line was drawn on platform: mobile ads are a much more personal, and potentially more invasive, than other channels. When it came to unwanted ads, while PCs and even tablets scored at under 10 percent for offensiveness, mobile handsets rated at 64 percent (UK) and 67 percent (U.S.). That seems to indicate that although some analysts like eMarketer project that mobile ads will make $2.5 billion in revenue in the U.S. this year — their effectiveness may not match that investment. Mediums. 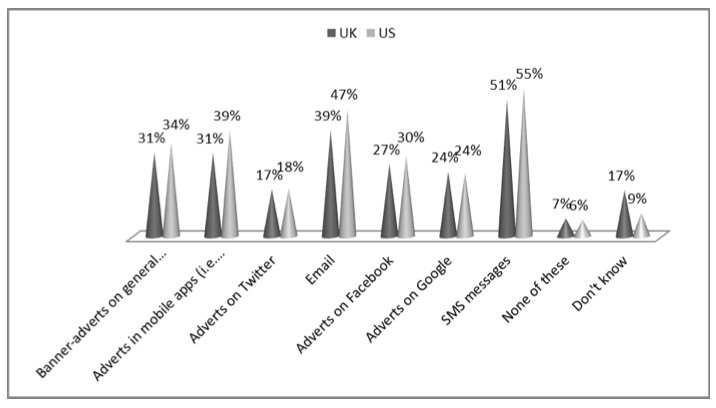 Connected to the sensitivity around mobile, SMS and mobile apps were two of the least-liked channels for receiving ads. But in what might be good news for Twitter as it rolls out its advertising services, it scored as the least-annoying channel for ads compared to Facebook and Google. Where is the silver lining? There do seem to be some small shoots of hope for the digital marketing industry — if advertisers can think of better ways of matching their brands (or their campaigns) to their target audiences. The numbers are still not brilliant, but at least 26 percent said they would be happy to get ads aimed at their personal interests; 21 percent were interested in ads that were “contextually relevant” and between 19 and 22 percent liked the idea of ads that were location specific.